Biography/Paintings of Italian Baroque Classical Painter, Bolognese School. Theme: "Loves of The Gods"
The Italian artist, Annibale Carracci was one of the most admired painters of his day, and one of the most influential Old Masters in the transition from Mannerism to the Baroque. Rejecting the artificial style of Mannerist painting, Annibale championed a return to naturalism and the artistic ideals of Renaissance Masters like Titian (c.1490-1567), Tintoretto (1518-94), Paolo Veronese (1528-88) and Correggio (1489-1534). Carracci collaborated closely with his brother Agostino Carracci (1557-1602, painter and engraver) and his cousin Ludovico Carracci (1555-1619, painter) on many projects. Together they established the Bolognese school of painting (centred on the Carracci Art Academy) to encourage drawing from live models and to discuss theoretical issues of art and design. 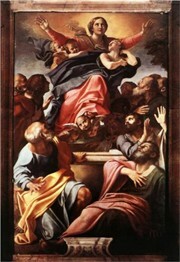 By pioneering a style combining naturalism and classicism with fresh figures and lively Venetian colours, the Carracci dynasty was credited by contemporary critics for having rescued Italian art from the twin evils of Mannerism and Realism, and for helping to establish Bologna as a centre of distinctive 17th century Baroque painting. Their anti-Mannerist style also fitted perfectly with the campaign of Catholic Counter-Reformation Art, and as a result brought them numerous commissions. They went on to influence a number of important artists including Poussin (1594-1665), Rubens (1577-1640) and Bernini (1598-1680). See also: Classicism and Naturalism in Italian 17th Century Painting. Annibale's best Baroque paintings include: his frescos at the Farnese Gallery (Rome, 1590s), his altarpieces such as The Assumption of the Virgin Mary (1601, Santa Maria del Popolo, Rome) as well as oil paintings like Flight into Egypt (1604, Doria Gallery, Rome) and Christ Wearing the Crown of Thorns, Supported by Angels (1585-87, Gemaldegalerie, Dresden). 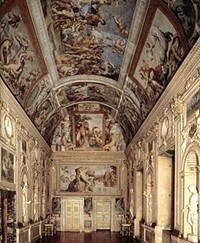 Annibale Carracci was born in 1560, Bologna. Little is known of his early life, except that he was probably apprenticed within the family. His brother Agostino and cousin Lodovico were also painters, and together the three artists opened their own studio in the 1580s. Initially the studio was called the Academy of the Desiderosi (desirous of fame and learning) but then became the Academy of the Incamminati (progressives). Where Lodovico's early painting was distinctly Mannerist in style, and Agostino initially practiced the more lucrative area of engravings, Annibale caused shock waves with his more naturalistic style. His earliest known work of Christian art, Crucifixion (1583, Santa Maria della Carita, Bologna) shocked an older generation of artists who insisted on idealized forms in the Mannerist style. Annibale, on the other hand, painted naturalistic figures from live models and there were suggestions that he did not treat the subject matter with appropriate dignity. In about 1583 the Carraccis received their first joint commission - two mythological fresco friezes for the Palazzo Fava in Bologna. This was followed by more commissions, and it was said they improved upon Michelangelo's sculpture with their 1589 masterpiece, the Founding of Rome (frieze, Palazzo Magnani). In about 1585 Annibale came under the influence of the Urbino painter Federico Barocci (c.1526-1612) who was creating a new art form that incorporated Correggio's taste for Venetian colours and sfumato effects, with some Mannerist tendencies. Although all three Carraccis were master draughtsmen, by the early 1590s Annibale had emerged as the greatest artist in the family - a reputation based on a variety of portraits, landscapes and genre-works - see for instance, The Laughing Youth (1583, Borghese Gallery, Rome) and Two Children Teasing a Cat (1590, Metropolitan Museum of Art, New York) - but principally on a number of large examples of altarpiece art for churches in Bologna and other towns in northern Italy. Then in 1594 he was summoned to Rome by Cardinal Odoardo Farnese (1573-1626) to decorate the family palace - a project which secured his place in the history of art. The gallery of the palace housed one of the finest collections of ancient sculpture. Annibale decorated the vault with a gallery of delicate mythological painting, which was acclaimed as an unrivaled masterpiece. In fact, for more than two centuries (1600-1800), Annibale Carracci's Farnese Ceiling was ranked alongside Michelangelo's Sistine Chapel frescoes and the Raphael Rooms in the Vatican, as one of the great masterpieces of painting. It was hugely influential, not only as a catalogue of heroic figurative design, but also as a model of technique: Annibale made hundreds of preparatory sketches and studies, and this type of elaborate preparation became accepted as essential for any major pictorial work. For his figure painting, Annibale used live models, which gave his characters a vigorous, natural effect. Merging the naturalism of the school of Flemish painting, with the colour and freshness of Venetian painting, he was forging a new style. The revolutionary potential of this new style would be taken up and developed by Caravaggio (15711610), who was Annibale's biggest rival and the most innovative of all Mannerist artists. However, the Farnese fresco masterpiece ensured that Annibale exercised a more widespread influence than his Mannerist contemporary, as the latter was interested only in oil painting, rather than fresco which was still seen as the critical medium for historical paintings executed in the Grand Manner. Annibale also produced a good deal of purely religious art: his most important paintings being Pieta (1599, Museo di Capodimonte, Naples) and Christ Wearing the Crown of Thorns, Supported by Angels (1587, Gemaldegalerie Dresden). In this painting, Christ is placed in the centre of the painting, half length and supported by two angels, his head dominating the picture. Other powerful, humanised works include his: The Mystic Marriage of St Catherine (1585-87, Museo Nazionale di Capodimonte); The Penitent Magdalen in a Landscape (1598, Fitzwilliam Museum, Cambridge) and The Temptation of St Anthony Abbot (1597, National Gallery, London). In 1600 he competed directly with his rival Caravaggio when he was commissioned to paint an altarpiece for the Cerasi Chapel, Santa Maria del Popolo, Rome - The Assumption of the Virgin Mary - Carvaggio worked on the side paintings. Annibale was also a pioneer of landscape painting, which are also considered important in the development of Western Art. His painting The Ideal Landscape (1598-1601, Doria, Rome), displays a classical, idealised landscape onto which he placed a figurative mythological scene. His pupils Nicolas Poussin (1594-1665) and Domenichino (1581-1641) were directly influenced by these works and would go on to develop their own idealised landscapes. Annibable was one of the first Italian Baroque artists to paint a picture where the landscape took importance over the figures and narrative, as exemplified by his painting Flight into Egypt (1604, Doria Gallery, Rome). He also produced a few portraits, mainly self-portraits, which indicate a subtle sense of humour. See, for instance, his Self Portrait in Profile (c.1590, Uffizi Gallery, Florence) and his Self Portrait (1604, Hermitage, St Petersburg). In the latter, the viewer is treated to a portrait of the artist, set on a canvas, on an easel, placed in his studio. The artist also created caricature drawings, and is considered one of the first artists to introduce this art form. Annibale's last years were pretty miserable; he suffered from depression, which was compounded by difficulties in getting paid for his work at the Farnese Gallery. He is not known to have painted anything after 1605, when he contracted a fatal disease, although he made a few sketches the following year. His work includes a great many powerful, authoritative drawings (studies from nature, landscapes, caricatures, projects for large decorations), often in black chalk, touched up with white. The Louvre and the Royal Collection in Britain (Windsor Castle) house a number of series. He died in 1609 and was buried near the artist Raphael in the Pantheon of Rome. It is a measure of his success that on his death he was praised by Bernini, as well as French Baroque artists such as Nicolas Poussin. His work went on to influence numerous other contemporaries like Domenichino, Giovanni Lanfranco (1582-1647), Domenico Viola (1610-96), Guido Reni (1575-1642), Sisto Badalocchio (c.1581-1647), Francesco Albani (1578-1660), Peter Paul Rubens (1577-1640) and Carlo Maratta (1625-1713). The general admiration for his work lasted for 150 years, until Winckelmann and certain Neoclassical critics questioned his greatness, seeing in him a rather eclectic imitator. The Victorian art critic John Ruskin (1819-1900) was no more impressed: as a result, Annibale's artistic reputation suffered during the 19th century. However, it was firmly reinstated during the mid-20th century, and paintings by him can be seen in the best art museums in both Europe and America.  For more about famous classical Baroque painters, see: Homepage.